Nutrisystem D weight loss program, is a weight loss program for diabetics. This weight management program offers a variety of programs, as well as, delicious foods helps men and women with Type 2 Diabetes lose weight and lower A1C. Many people are working more and exercising less, and are prone to unhealthy weight gain. In many cases, fast foods loaded with trans fats, sugar and sodium are replacing healthy lunches. This has lead to an increase in adult onset diabetes. Type 2 Diabetes has reached epidemic levels in the US, and is affecting the health of men, women and children. The CDC reports 30 million people, or 9.4% of the population has diabetes. The good news is that with a proper diabetic diet, exercise and lifestyle changes, such as stop smoking and limiting alcohol consumption, you can control or even reverse Type 2 Diabetes. Nutrisystem D is the version of the popular Nutrisystem Diet Plan, that offers special meals for Diabetics, to help them control or even reverse Type 2 Diabetes. The D stands for Diabetes. 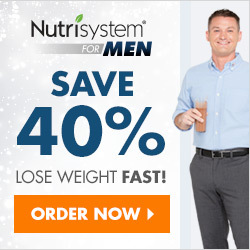 Nutrisystem D offers three diet plans for men and women with Type 2 Diabetes, which allows them to manage their weight, and to also lower A1C. If you don’t want to pick meals, then choose the Chef’s Choice Plan. 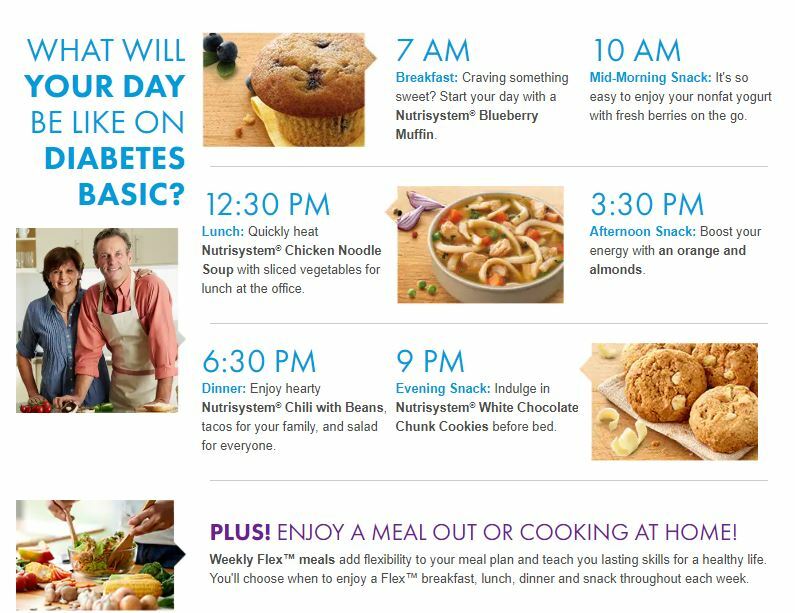 Nutrisystem dietitians have pre-selected the best diabetic meal options for you. If you like to have the variety to choose your own meals, then you should select the “I’ll Pick My Meals” option. This option is a bit more expensive, but gives you maximum flexibility to choose the meals. Nutrisystem D Basic plan is the lowest price and most affordable plan. With this plan the meals are pre-chosen for you. This plan generally includes the most popular meals for breakfast, lunch and dinner. This is a great way to learn about Nutrisystem D before investing more money into the weight loss program. 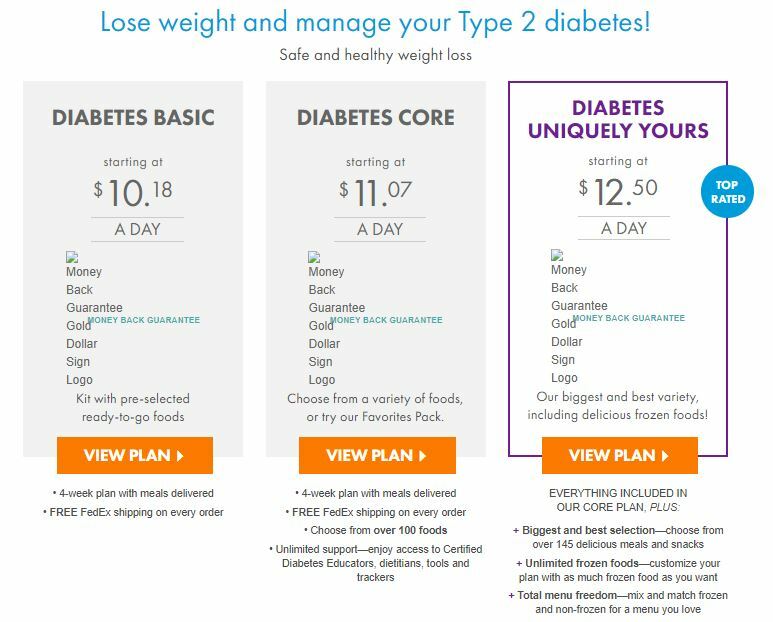 If your interested in the most affordable diabetic meal plans from Nutrisystem, then choose the Basic Plan. If you want the flexibility to choose your own meals, then the Core Pan from Nutrisystem is for you. You can choose from a variety of 100 meal options, so you won’t be bored with just a few diabetic meals. With the Core Plan, you also have online access to a licensed dietitian, who will help you develop a weight management plan, and will recommend the meals you should eat to meet your weight loss goals. The Nutrisystem Uniquely Yours Plan is the most complete weight loss plan for Diabetics. This plan gives you the most options to create the perfect diet plan for yourself, if money is not an option. 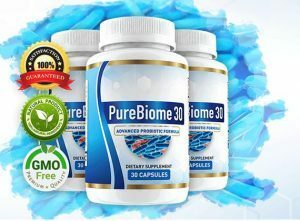 This plan offers all the benefits of the Core Plan, with so much more. You have access to choose from over 150 meal options. This includes a large variety of fresh and frozen meal options. With the Uniquely Yours Plan, you have online access to a licensed dietitian. They will help you develop a weight management plan, and will create the meal plan you should follow to meet your weight loss goals. 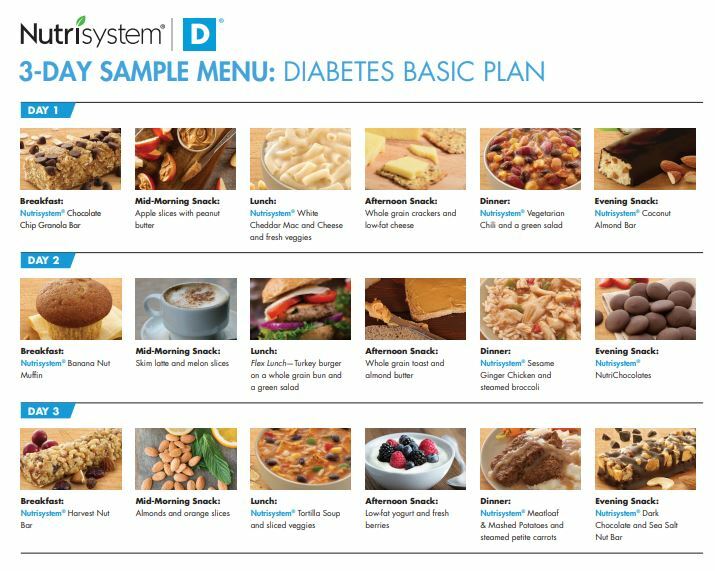 This is a sample 3 day menu for Nutrisystem D. Depending on the diet plan you choose, you can have anywhere from 100 to 150 delicious and nutritious meal offerings, which are all diabetic approved. With this plan you eat six small meals a day, that keep you satisfied and help you lose weight, and keeps your A1C in control. One of the biggest complaints people have about diabetic foods is that they can be bland, boring and limited, due to being low in sugar, carbs, sodium, fat and gluten-free. How a Nutrisystem D Daily Meal Plan Works? You can see with the Nutrisystem D diet program, you follow a structured daily eating schedule, in which you enjoy a meal or snack every 3 hours. This way of eating healthy portion-controlled meals keeps you satisfied while lose weight. When you feel satisfied, you are less likely to snack throughout the day. This prevents you from over eating too many calories during the day. Consuming too many calories increases you chances of gaining weight. To get started, just click the image below to select and order the perfect Nutrisystem D diet plan for Diabetes.